John Spires Holloway of Arabi passed away Thursday, February 7, 2019 at Crisp Regional Nursing and Rehab. He was born in Crisp County and was the son of the late John Calvin and Lilly Pearl Spires Holloway. He was also preceded in death by siblings, Charles Harvard Holloway and his wife Willa, and Dorothy Holloway. A veteran of the United States Marine Corp, John was always a farmer in his heart because of his love for the land. He enjoyed having a garden and he and Lynell always shared their bounty with friends and neighbors. He wore many work hats during the years; construction, hardware store and mobile home plants. 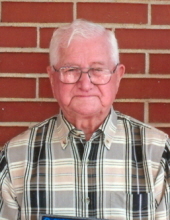 He attended Haw Pond Baptist Church for many years and was an ordained Deacon. With all his hard work he always found time for his family and fishing. Friends also remember him baking delicious cakes when the need arose. John is survived by his wife of 73 years, Grace Lynell Holloway of Arabi; two sons and their wives, Michael and Carlene Holloway of Cairo and Dale and Susan Holloway of Arabi; a brother and his wife, Elmer and Ella B. Holloway of Andersonville, SC; two sisters, Jeannette Bowen of Jacksonville, FL and Thelma Hauesler and her husband, Hulett of Arabi; grandchildren, Dale Shannon Lackey and her husband, Tony of Newbern, NC, Michael Holloway of Kernersville, NC, Christi Gibbs and her husband, Scotty of Cordele, Christopher Holloway and his wife, Elizabeth of Americus, Stephen Gainous and his wife, Sasha of Thomasville, Mark Gainous and his wife, Tasha of Milledgeville and Brooke Bailey and her husband, John of Cairo; and 15 great-grandchildren. A graveside service will be held at 2:00 p.m. Sunday, February 10, 2019 at Bay Spring Cemetery with Rev. John Leab officiating. There will be no visitation but the family will speak with friends after the service. The family asks that memorial donations be made to the Georgia Sheriff's Youth Ranch, P.O. Box 1000, Stockbridge, GA 30281-9878; Georgia Baptist Children's Home, 9420 Blackshear Hwy., Baxley, GA 31513 or to the charity of your choice. To plant a tree in memory of John Spires Holloway, please visit our Tribute Store. "Email Address" would like to share the life celebration of John Spires Holloway. Click on the "link" to go to share a favorite memory or leave a condolence message for the family.